"Star Wars Trilogy DVD review and more"
We have been pretty busy around here. 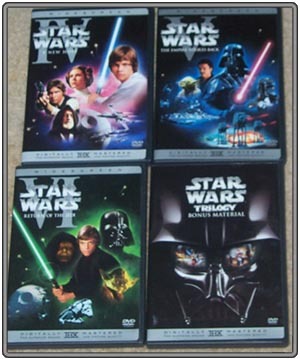 First up, we have our Star Wars Trilogy DVD review online. I cannot tell you enough how awesome the video transfers are on these films. They really do look amazing. Watching "A New Hope" will shock ya. You might also want to check out our three pages of screen captures of changes and weird things that we have made from our review discs. The Star Wars Trilogy comes out September 21st! Also, we had the chance to check out Star Wars: Battlefront while out in California this week. This new video game comes out September 21st (the same day as new DVDs) and really puts you in the Star Wars action. Nifty game for the X-Box and PS2. Last night some of us caught “Collateral” at the theaters. What a let down. Caught “Without a Paddle” out in LA last week and it was funnier than expected. Great cast too. Be excited about these new Star Wars DVDs… again, they look “most impressive”.